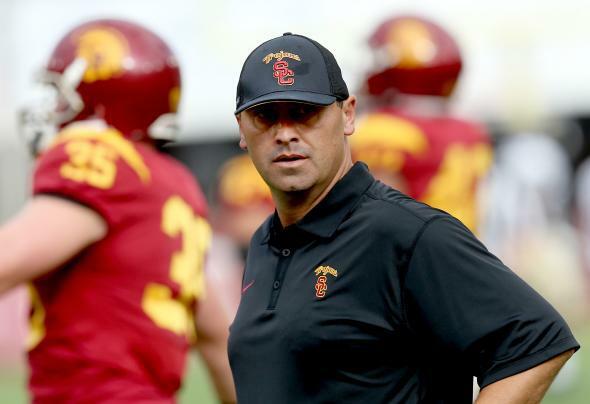 Football coach Steve Sarkisian sues USC over firing due to alcohol problem. Steve Sarkisian watches his team during warmups on Sept. 12, 2015. Sarkisian realized he needed help and left USC of his own volition before that afternoon’s practice, the lawsuit said. The lawsuit said Sarkisan was “upset, teary and nearly hyperventilating” before finally calling Haden on a speaker phone and asking for time off…Haden directed Sarkisian to speak to a USC sports psychologist who previously counseled the coach and placed him on leave. The next day, Sarkisian took a noon flight to an in-patient treatment facility. When he landed, the lawsuit said, he learned Haden had fired him when the coach saw a letter of termination attached to an email. USC has not commented on the lawsuit.